Downtown St. Louis. You can't miss it. ISO 100, F/18, 1/60 second, 14mm. 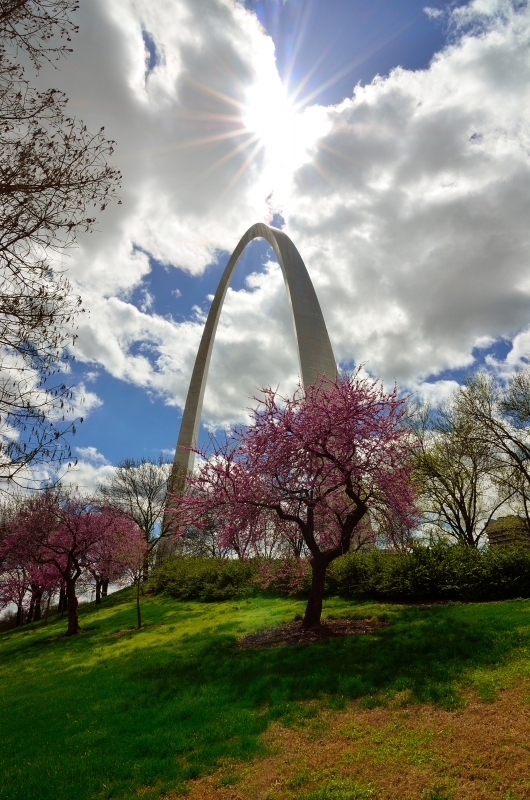 I shot this image on my lunch break when I was working as a Park Guide at the Jefferson National Expansion Memorial (The Gateway Arch) in St. Louis. Later that afternoon, while I was working at the top of the Arch, I was showing visitors how to take interesting images from the top of the 630â€™ monument. I had taken a few shots myself as examples, especially how to position a camera to capture both legs of the Arch. As I was showing the examples to a girl, visiting the Arch with her mother, I also showed her the images I shot earlier. When I showed her this one she was very impressed. She tried to take a picture of the image from my camera screen, but they didnâ€™t come out very well. I got her email address and told her I would send a copy. The Arch has many visitors, and I didnâ€™t have much time to talk with her further, but I sent her a copy of the image as promised. Her reply was very touching for me. She thanked me for sending her the image and told me that they were visiting the Arch on the anniversary of the day her parents had their wedding pictures taken on the grounds, and that her father had passed away recently. Then she wrote, â€œI know that the sunburst over the Arch that day was my father looking down on usâ€. I love it whenever Iâ€™m able to sell an image, but being able to provide an image that touches another so deeply gives me great satisfaction, as it should, and most likely would, any photographer.